Maelruan was a Munsterman, who was educated in a monastery in Dairins, a tiny island, in the River Blackwater near Youghal. He came to Tamhlacht in the 8th Century and founded a monastery here. Maelruan introduced very strict rules in his monastery. The members of his community became known as “Ceili De” or “Culdees” and they aimed to reform and renew religious life. Maelruan encouraged piety, self sacrifice and the pursuit of knowledge. Followers of Maelruan carried his rule to other parts of Ireland. Some outstanding manuscripts were produced by the monks in the Tallaght monastery – The Martyrology of Tallaght which is in the Burgundian Library in Brussels and Teagasc Maelruain. Naomh Maelruan died on the 7th of July, 792. 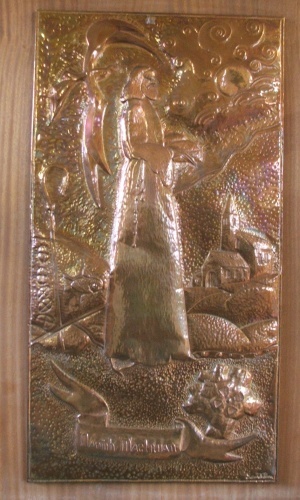 Our copper picture of Maelruan reminds us of the main achievements of his life and high regard in which he was held. The monastery and the Celtic Cross remind us of the monastery he found 1200 years ago. The “sun” surrounded by Celtic designs reminds us of his close friend and follower Oengus. The loaves and the fishes and the dove with the olive branch in its beak remind us that “peace, piety and plenty prevailed in the monasteries of this island when Maelruan was alive. The quill in Maelruan’s hand reminds us of the manuscripts which were written by the monks in his monastic settlement. Very little remains of Maelruan’s monastery which was situated where the Church of Ireland building, St. Maelruan’s church is today. A simple granite cross mounted on an ancient millstone, a granite basin and the obscure remains of a circular ditch behind the present church is all that exists today to remind us of the original buildings.